Throughout the winter and during the holidays, it is especially important to exercise. A certified personal trainer scheduled into your day can help. It is often difficult to stay healthy and fit on your own and without help creating realistic fitness goals. The shorter days, busier schedules and heavier food make it even more challenging to lose or maintain weight. 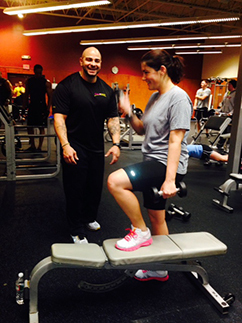 Personal training program in Canton, MA help you stay in shape during the holidays. As a matter of fact, you may even lose weight during the busy holiday season. This may even be one of your fitness goals for the New Year. But why start after the holidays, keep the weight off while the party season is in full-swing. This will make it that much easier to lose weight as a resolution. The personal training programs are customized just for you. This means they are more fun, effective and less of a burden because you will see faster results than if you try to go it alone. Your trainer can redefine your program for your holiday schedule as well. For example, short bursts of intense workouts can be added to fire up your metabolism and fast-track results eliminating the need to carve out large amounts of time during a busy schedule.